Eminent urologist with a passion for vintage cars and themed parties who was a pioneer in the use of keyhole surgery. Until 1991, a patient whose kidney had been removed would be left with a 9 inch scar that would not disgrace a war veteran. 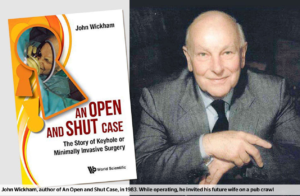 All that began to change in August of that year when John Wickham and his colleague Malcolm Coptcoat removed a kidney from a patient at Dulwich Hospital in southeast London through an incision less than half an inch long. They used an endoscope, which was passed through the small hole into the body, to help them to separate the kidney from the surrounding tissue. After the kidney had been freed it was popped into a watertight nylon bag. Still, inside the patient, the bag was drawn to the site of the incision, where an instrument working like a blender could be introduced. Once the kidney had been macerated to the consistency of baby food, it was sucked out and the bag removed. Although he wrote several articles for medical journals and founded the Society for Minimally Invasive Therapy, Wickham was experimenting as he went along and “got away without controlled trials etc. . . . . if something worked and caused no damage we continued”. Although the procedure quickly caught on in the US, some practitioners in Britain were unconvinced. A year later Wickham expressed his frustration to The Times. “We still have far too many surgeons who believe that unless you cut a hole big enough to get your head in, you cannot see well enough to perform a proper operation,” he said. John Ewart Alfred Wickham was born in Chichester, West Sussex, in 1927, the son of Alfred, who was involved in event management, and his wife, Hilda (née Cummins). John was five when his father died and soon he and his mother moved to a flat on the seafront in Littlehampton. He was educated at Chichester High School for Boys, where it is reported in the Martlet (Vol 4, No 4 December 1944, page 5) that a J.E. Wickham was awarded the Oxford School Certificate with exemption from London Matriculation; see also Vol 4 No 10 December 1946 page 9 when the same pupil obtained the London Higher School Certificate in three main science subjects plus a subsidiary in chemistry; see also in that same edition (page 8) his exemption from the 1st M.B. examination of London University. He enjoyed “tinkering” with things, including dismantling and reassembling old aircraft engines. On one occasion he built an Austin 7 out of two wrecks. In later life, he acquired vintage cars, including a remarkable collection of Daimlers. As a child, he was given “epilation radiotherapy” on his scalp to eradicate ringworm, a procedure that he blamed for a lack of hair as an adult. Although nobody in the family had a medical background, he was offered a place at St Bart’s hospital in London in 1946 but had to spend two and a half years doing National Service with the RAF, where he ended up as a nursing orderly. Eventually, he returned to the hospital to complete his medical qualifications, including a BSc in psychology. In his final examination, he had to examine a patient with a cardiac complaint. He listened carefully with a stethoscope before admitting with great mortification that he could hear no abnormality. “That’s all right, neither did we,” the examiners told him. His training encompassed all aspects of surgery, including obstetrics. Wickham had in mind to study neurology, but found it a bit “sterile”. Soon a post came up at Hammersmith Hospital, “a most exciting place”. Here he worked in peripheral vascular surgery, which he said was the best part of his training. “Once you’ve done a few aortic resections you just do not worry about bleeding and you can cope with anything major,” he said. Before long he was turning to urology. During his first inguinal hernia repair, a senior colleague left to take a phone call. Wickham was spared embarrassment only by guidance from the anaesthetist. By this time he had met Ann Loney while carrying out an urgent below-knee amputation. He was transfixed by her blue eyes showing over the top of her operating mask and, as the patient’s leg came off, he invited her on a pub crawl. They were married in 1961. He won a Fulbright scholarship and spent a year at Lexington University in Kentucky, where he studied renal ischemia and completed his master’s degree. Along the way, he discovered that kidneys, which had to be clamped during surgery to avoid blood loss, could survive much longer when cooled. He was offered a post as professor of urology in Lexington. “It was a terrible dilemma,” he said. “But my wife and I finally decided we’d rather have English children than American children.” Ann survives him with their three daughters: Susan, who runs a church charity; Caroline, who is matron at Oakham School in Rutland; and Clare, who leads a private life. He performed his first kidney transplant in June 1971 and, by the end of the decade, was established as the surgeon of choice for kidney operations. However, the trauma of removing small renal stones remained. In 1985 he came back from West Germany having seen a two-stage operation to treat kidney stones that was the precursor of keyhole surgery. It involved the stones being disintegrated by a shock wave. Patients were lowered into a bath and given a local anaesthetic. Wickham went on to develop the Probot, the first autonomous surgical robot, which is used to cut into the prostate, a gland that is difficult for surgeons to reach. Its early trials were on potatoes. After retiring in 1992 he set up Syclix, a company that developed surgical instruments. In the meantime, he had acquired a large 16th-century house in Westcott, near Dorking in Surrey, with an outdoor swimming pool and where the Wickhams hosted a series of themed parties.